Have you ever wondered what a perfect bite of the Holiday tastes like? I think for each of us, the holiday has a unique memory. Maybe it is the taste of peppermint candy canes, spiked egg nog or grandmas' cinnamon rolls in the morning. What Does the Holiday Taste Like? 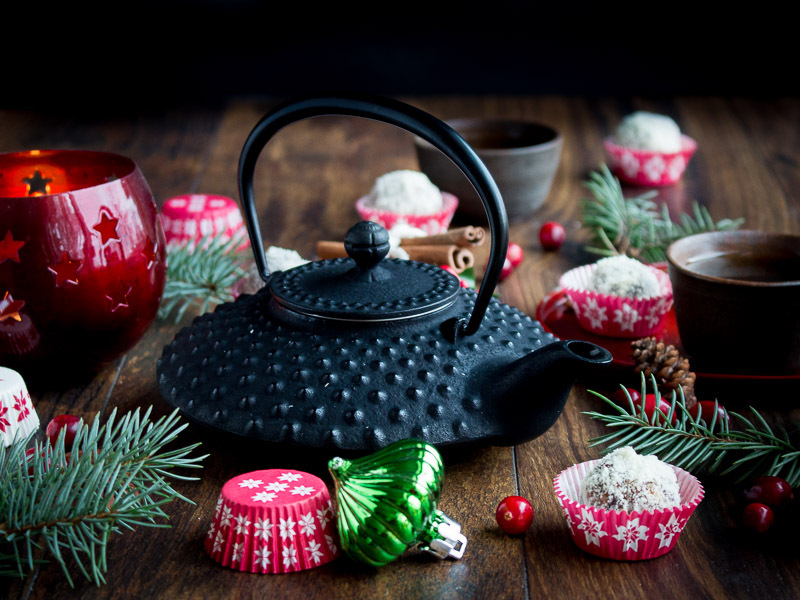 We were sitting down with a snuggly cup of fragrant Christmas Tea Organic Black Tea from Fraser Tea. I closed my eyes and thought to myself this does tastes just like the perfect cup of Christmas. I can almost hear Santa and his sleigh landing on the roof. You can smell the essence of citrus, cinnamon and cranberries rising from my steamy cup of tea. You are going to love these No Bake Cranberry Bliss Balls as they are chewy, aromatic, taste just like the holiday. They take only 20 minutes to whip up. You gotta love that! 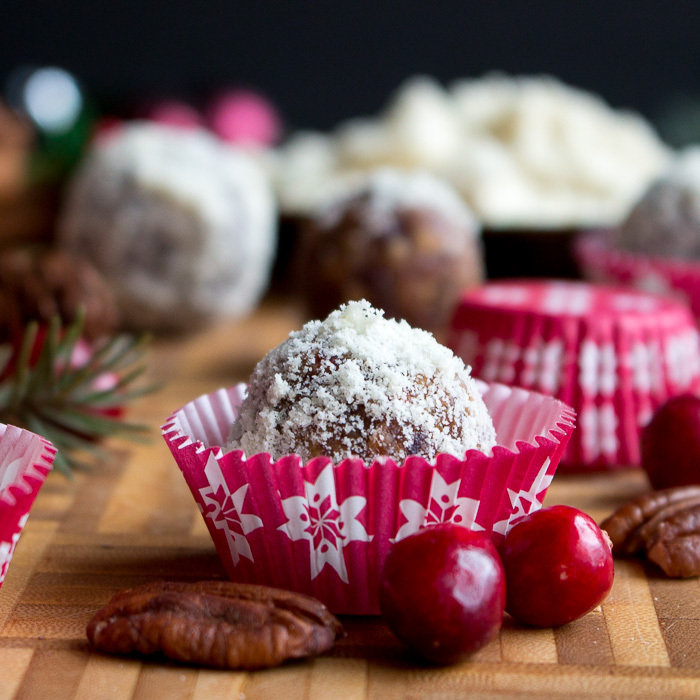 These little No Bake Cranberry Bliss Balls are an easy healthy snack for on the go. Right now final exam time is in full swing and these make great treats for those "HANGRY" students. Hangry is partly hungry and angry at the same time. Gosh we can't have that! 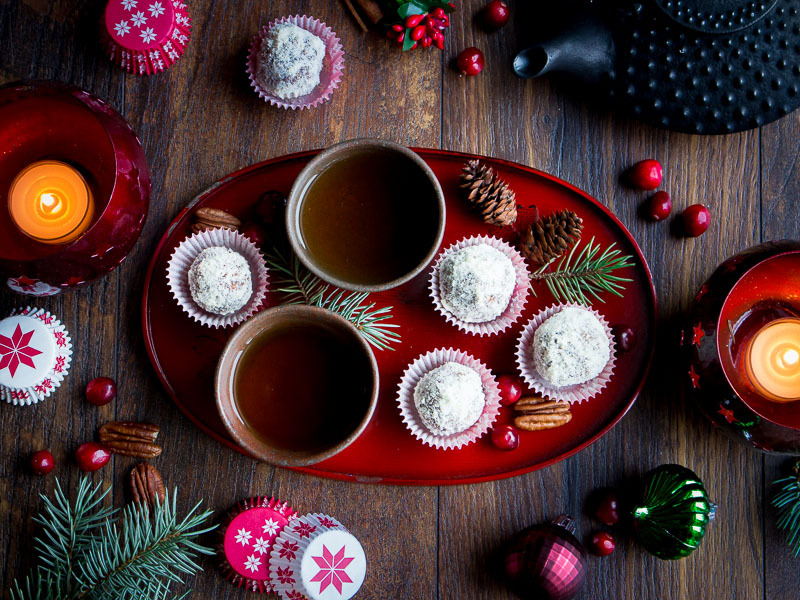 Feed those hungry students a few No Bake Cranberry Bliss Balls. 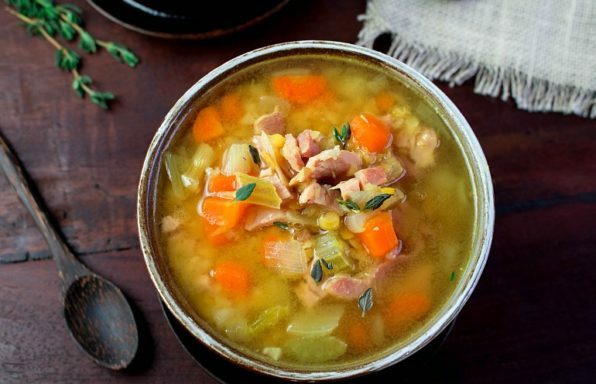 We originally posted this recipe in December 2013 but wanted to let your eyes set on a new set of photos and updated recipe. 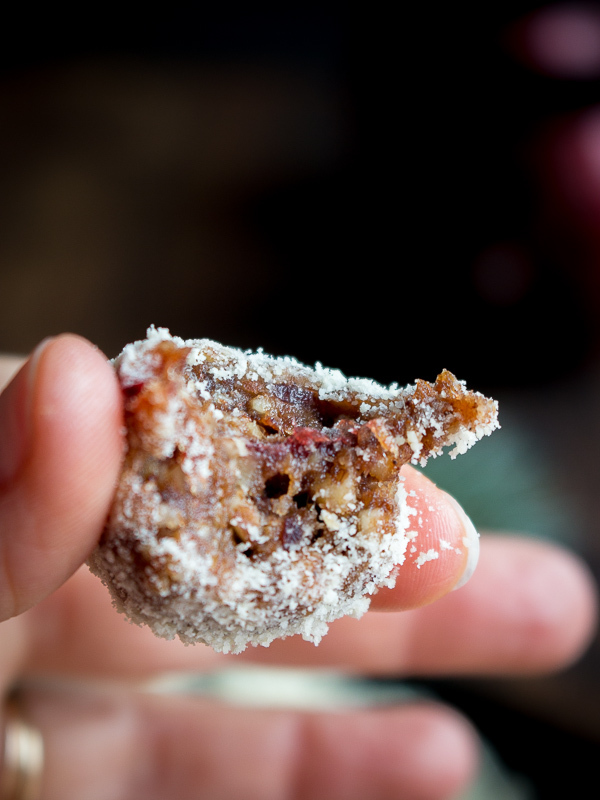 No Bake Cranberry Bliss balls are made with pecans, walnuts, dates, dried cranberries, spices and orange zest that would make sugar plums dance in your head. These little holiday wonders are chewy, sweet and little bit tart, fragrant and full of wholesome goodness and Christmas spices. 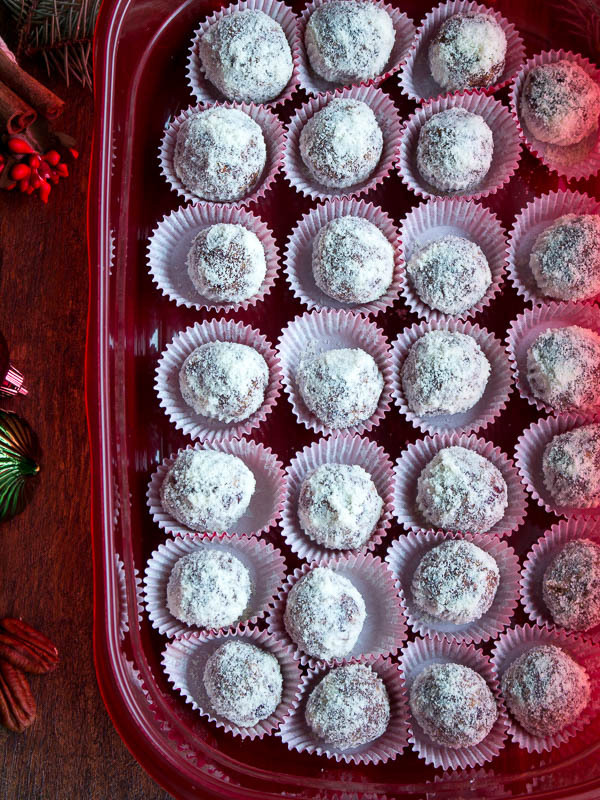 No Bake Holiday Bliss Balls are rolled in a little ground almonds that makes it look like fresh snow. 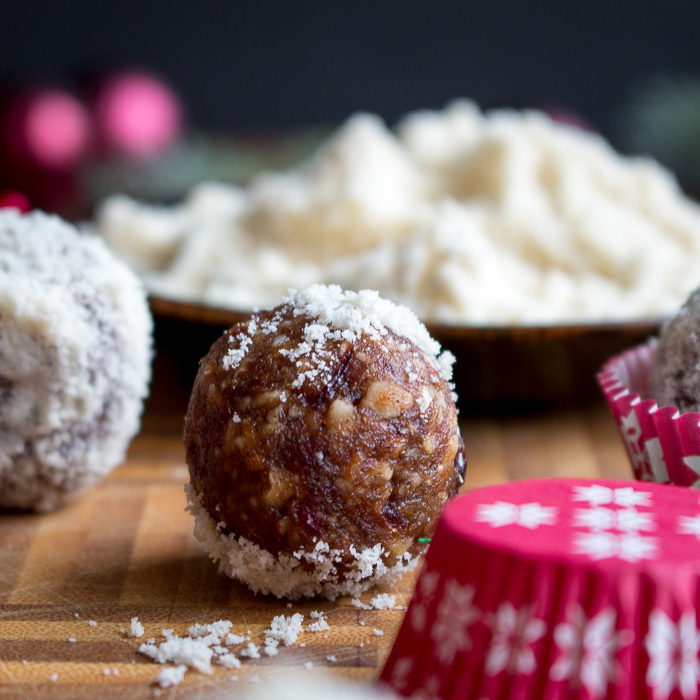 These little Cranberry spiced holiday balls are gluten-free, lactose free, egg free, vegan, and even can work in small portions on a paleo diet. We used no sugar added dried cranberries to keep is refined sugar free but feel free to use sweetened dried cranberries if you wish. 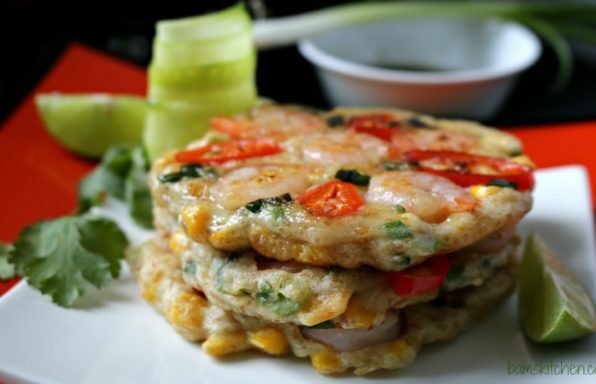 In addition, no oven is required to make these little delicious bites. 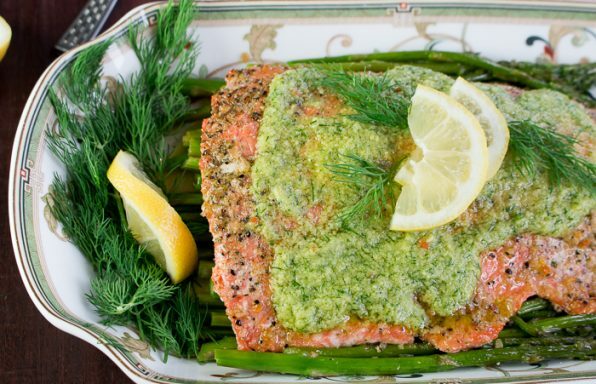 They are great as gifts and store easily in the freezer until you are ready to serve. 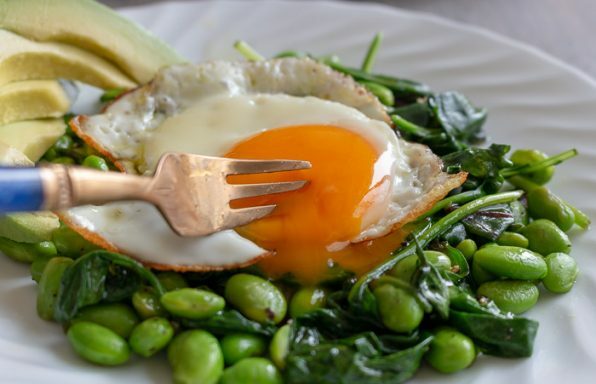 You can even feel like you are being a little bit naughty but still be true to your diet as you give yourself a little treat this holiday season. We used a food processor to grind up the pecan and walnuts. (If you do not own a food processor you may be able to use a blender but a little more difficult or use a mortal and pestle for nuts and chop fruits with knife but it is a lot more work.) If you decide to put your nuts in the food processor, don't decide to help your kids with their homework or start on dinner until you remember to take your finger off the pulsed button. One step beyond ground and it becomes "nut butter". Now, we have some fantastic pecan butter that is actually quite lovely and have been using it to make peanut butter and jelly sandwiches. However, the consistency you are looking for here is a rough crumble. 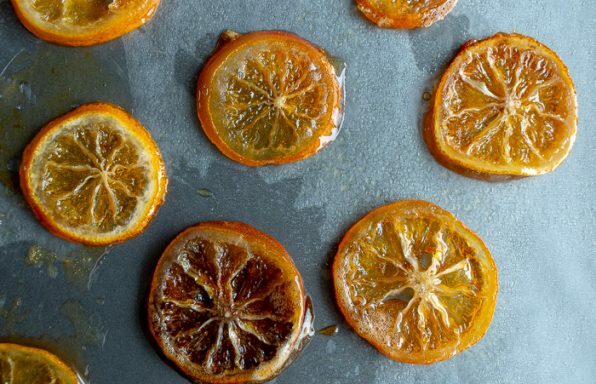 A bit of fresh citrus zest adds a vibrant flavour to these little Holiday Balls. 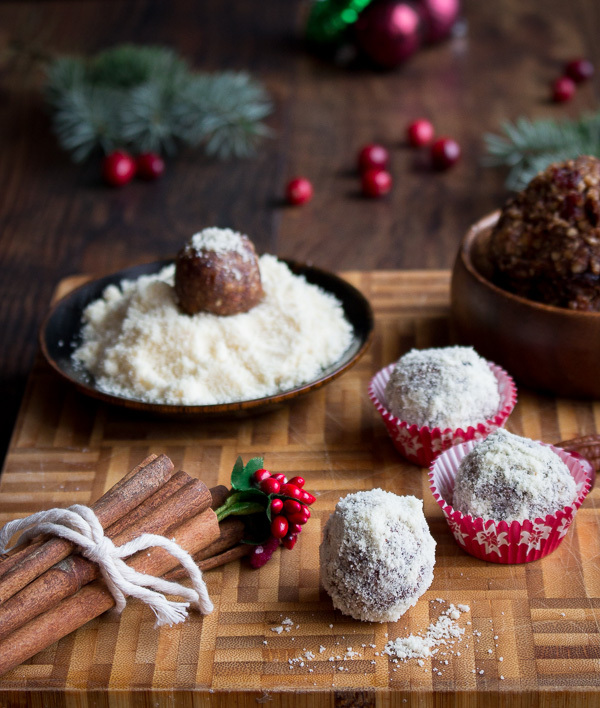 We used naturally sweet dried Medjool dates as a method for making these No Bake Cranberry Bliss Balls sweet without adding any unrefined sugar. You can use any dates you prefer but Medjool dates are really the best. They act as a binding agent to hold these no bake cookies together. 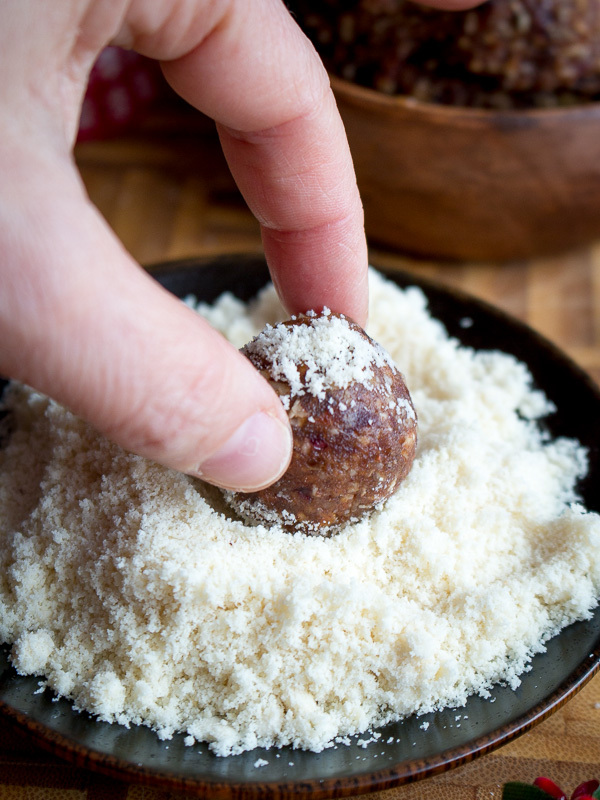 Pre-soaking the dates in with a few teaspoons of hot water first works like a charm to make a soft date paste. Have you Ever Baked with Green Banana Flour? If you are looking for more gluten free and vegan cookies to enjoy this holiday season, be sure to try our Dark Chocolate Macadamia Nut Cookies and our Chewy Mandarin Orange Cookies. Both of these cookies are made with green banana flour. If you have not yet tried green banana flour for baking, you are in for treat. We love it. If it makes you feel any better we have not even started. We have made a couple of batches of cookies and that is about it. We have just bought a 12 foot tree. Yes, 12 feet. Do you remember the line from National Lampoons Christmas Vacation? "Rusty this tree is not going into our yard, it is going in our living room." Oh my word, we are going to have to do lots of decking out to do. We need all of our tall friends to please come over and visit. We have lots of holiday treats and Fraser Tea to share if you can just put that Star up on the top of the tree. We just ordered a Tea gift package from Fraser Tea and had it sent with a free personalized gift card to our tea loving friends. From now until December 25, 2018, you can get 10% off your order when you enter the code Holiday10 on checkout. It is just so busy around the holidays. Ordering online really takes the stress out of the holidays. Wishing Everyone a Super Holiday Season! 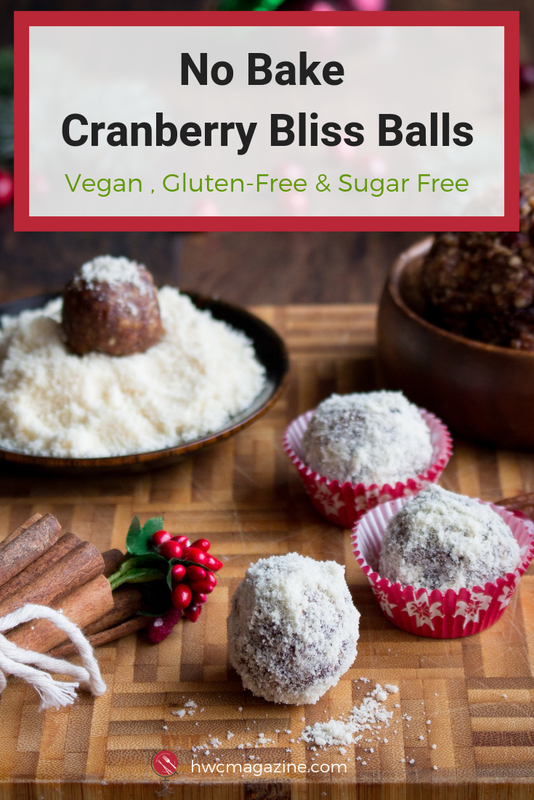 Go ahead and whip up a batch of No Bake Cranberry Bliss Balls this weekend and you can have something a little naughty and nice to keep you feeling satisfied over the holiday season without blowing your diet. 1Place hot water in dates and cranberries to soften for about 30 minutes. 2Place walnuts and pecans in food processor to crush until a coarse meal. If you like your bars more crunchy do it less and if you like your bars more chewy pulse more but not so long that you make nut butter. 3Drain dates and cranberries of extra water and place in food processor to chop and mix until you have a date paste. Mix cranberries in food processor until a coarse meal. 4Mix the date paste, cranberries, ground pecans and walnuts together. 5Add ground ginger, cinnamon, allspice, salt and orange zest to mixture and mix well. 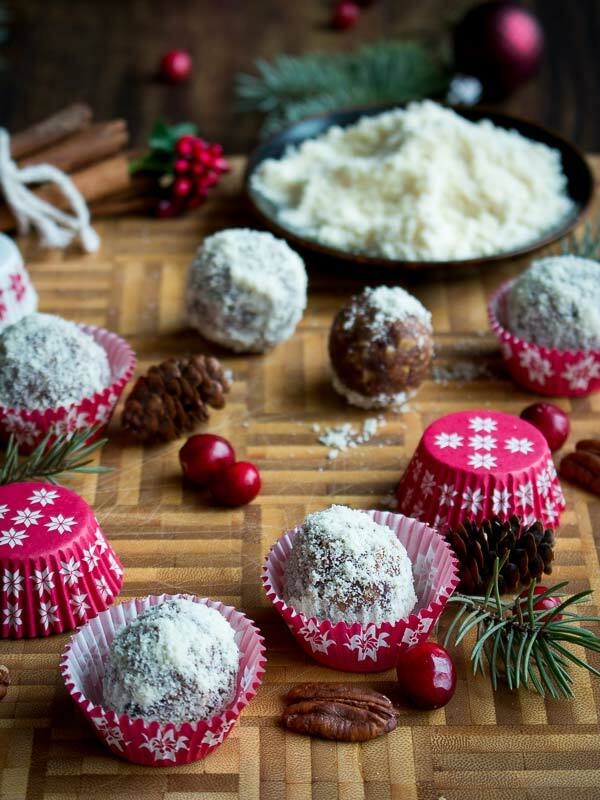 6Form into 1.5 inch balls and roll into ground almond meal and place into Christmas paper cups. 7Place Cranberry Spiced Holiday Bars in freezer for at least 6 hours or overnight and serve. You may just want to keep them stored in the freezer as they are really nice cold and chewy. 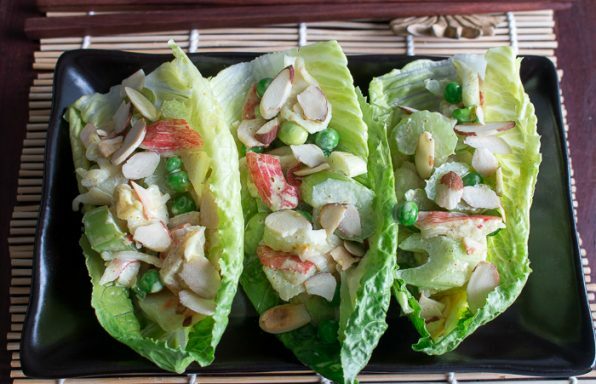 8Wrap up and give away for gifts or simply enjoy as a healthy snack anytime you need a little energy. 9Chef's Notes: Feel free to use whatever nuts you have on hand. We used unsweetened cranberries as we are trying to cut down on refined sugar. However, feel free to substitute sweetened dried cranberries as this is even more delicious.